Our Independent Learning Centre, known by the girls as the ILC, is a welcoming space for private or group study, for classes, or for girls to simply relax with a good book! The ILC houses a multitude of resources to support learning across the curriculum, and our knowledgeable Librarian frequently collaborates with subject teachers on research projects for various topics and provides resources for class activities as and when needed. Girls can access our library catalogue on any school computers or at home via Silverlight or on mobile devices by downloading the App. The catalogue can be found here. As well as our Librarian, who has a wealth of knowledge about the resources available, and is the perfect person to ask for a book recommendation, we also have Library Assistants, ranging from Year 7 through to Sixth Form students on hand to help other pupils. A suggestion box is available to all students to put forward their ideas for new books, author visits, or general proposals for the ILC. As a library, there’s a wide range of fiction and non-fiction works, as well as specific sections for Careers, Foreign Language fiction, Biographies, magazines/journals both in paper and digital formats and subscription databases which enable students to access up to date reliable and relevant information at the point of need. Furthermore, if a certain book isn’t available, girls can order online from local Kent County Council Libraries. Our Librarian has ensured this facility is available to increase the variety of books available, and to make sure that book clubs have enough copies to cater for everyone. There are tailored recommended reading lists for the whole school community, including a specific list of books ideal for students with dyslexia. Year 7 girls have timetabled ILC lessons, once a week. During these lessons, an extension of their English classes, girls are taught research skills, as well as being encouraged to enjoy reading for pleasure. In addition, Year 12 also have research skills sessions to assist with their Sixth Form courses, as well as to provide preparation for university study. One of the ILC’s key aims is to encourage and promote literacy, and to foster a love of reading. 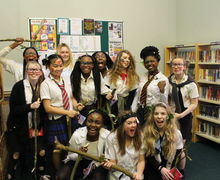 Several extra-curricular clubs are based in the ILC, including the Staff & Sixth Form Book Club, The Southern Schools’ Book Awards Book Club, and the Carnegie Shadowing Club. There are often events, such as non-uniform days, competitions and activities, organised to celebrate dates such as World Book Day, and Roald Dahl’s birthday. Girls are also encouraged to take part in Readathon challenges. Working closely with the English Department, author visits are frequently held in the ILC, with award-winning authors such as Frances Hardinge, Nicky Singer, Christopher Edge, and Cobham Hall Elder Griselda Heppel. Girls are free to suggest an author they would like to hear from. 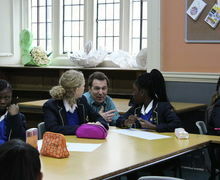 Such visits often include a creative writing workshop for Lower School pupils, and these are always incredibly popular and very engaging.